As soon as I saw the trailer, I knew I needed to see Disney/Pixar's Inside Out. More often than once, I've wondered "What are you thinking?" when it comes to family members and friends. Perhaps I should have been focusing on, "What are you feeling?" That's exactly what Inside Out does - it takes you inside the human mind - complete with employees, headquarters and work flows for emotions and memories. Do you ever look at someone and wonder what is going on inside their head? Disney/Pixar’s original new film Inside Out ventures inside the mind to find out. When Riley's family relocates to a scary new city, the Emotions are on the job, eager to help guide her through the difficult transition. But when Joy and Sadness are inadvertently swept into the far reaches of Riley’s mind—taking some of her core memories with them—Fear, Anger and Disgust are left reluctantly in charge. Joy and Sadness must venture through unfamiliar places—Long Term Memory, Imagination Land, Abstract Thought and Dream Productions—in a desperate effort to get back to Headquarters, and Riley. 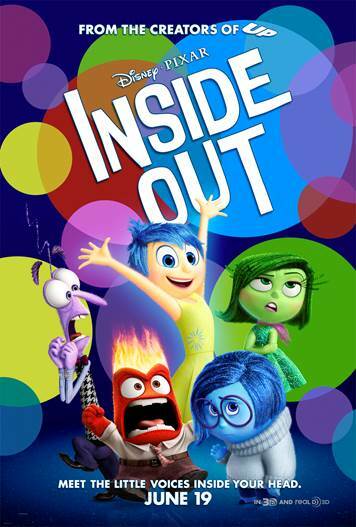 Inside Out was directed by Academy Award® winner Pete Docter ("Monsters, Inc.", "Up"), produced by Jonas Rivera, p.g.a. ("Up") and featuring an original score by Michael Giacchino ("The Incredibles," "Ratatouille," "Up"). Anger was definitely Hannah's favourite emotion and he has some of the best lines of the film. I liked Disgust best. Make sure to stay for the credits to get inside the heads of many different mammals. Hannah really enjoyed the short Lava, shown before the film started. She is still talking about the volcano who stars in it a week later. Are you seeing Inside Out this weekend? Disclosure: My family attended an advanced screening of Inside Out for the purpose of this review. As always, opinions on this blog are my own.